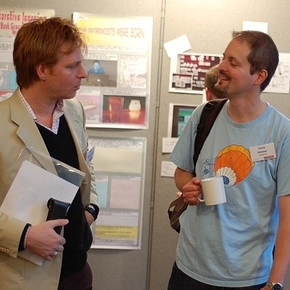 Chris Rimmer (on the right in the picture) presented an excellent comic-book style poster at XP Day to publicise the Oxtremists study group in Oxford. That got me thinking... would a comic book be a good form for end-user documentation? It would be fun to write, would be good for showing graphical user interfaces and comic books have well known conventions for annotating pictures with to show movement and sound and direct the readers attention to detail. I'm not the only one to think this. The developers of BJS, an open source game project, had the same idea and have already published their user manual as a comic book. Update: Sun used the comic book form for the user documentation of their AnswerBook product way back in 1991. Update:These graphic resources could be useful for writing comic-book documentation. Update:Kevin Cheng has posted a list of resources for creating comic book content for design and end-user documentation. Copyright © 2006 Nat Pryce. Posted 2006-12-19. Share it.